India is to recruit retired army personnel to guard sanctuaries containing the country's increasingly endangered tiger population. The government announced the creation of a tiger protection force after a recent study found that the animals' numbers had fallen to under 1,500. 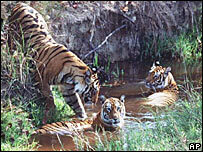 India's last major survey in 2002 put tiger numbers at 3,642. Wildlife activists blame poaching and urbanisation for the decline and say the authorities must do more. The announcement of the tiger protection force came among a list of "urgent measures" by the environment and forests ministry to protect the big cats in Indian forests. The ministry did not specify how many ex-soldiers would be recruited. In May, a census commissioned by the government showed that India had far fewer tigers living in the wild than had been thought. The study, conducted by the Wildlife Institute of India, showed tiger numbers falling in some states by two-thirds in five years. The final report is due out in December. Wildlife experts have criticised the Indian government for failing to crack down on poachers and the illegal trade in tiger skins. Tigers are poached for their body parts - skins are prized for fashion and tiger bones are used for oriental medicines. Tiger pelts can fetch up to $12,500 in China. According to reports, there were 40,000 tigers in India a century ago. The country is home to 40% of the world's tigers, with 23 tiger reserves in 17 states.